Batman and the KGBeast engage in a brutal battle in this week's Batman, and to win the Dark Knight has to pull out all the stops. Spoilers incoming for Batman #57, so if you haven't read the issue yet you've been warned. 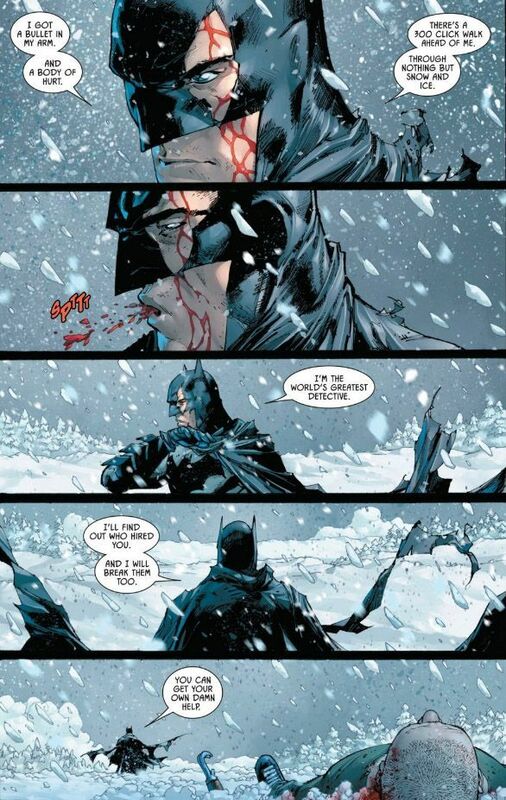 Batman battles KGBeast out in the middle of nowhere surrounded by the ice and snow. KGBeast is one of the deadliest soldiers out there and gives Batman more than a run for his money. In fact, he gains the upper hand on more than one occasion, shredding Batman's mask and leaving him rather bloodied as a result. Batman hits the ground at one point, with KGBeast standing over him. 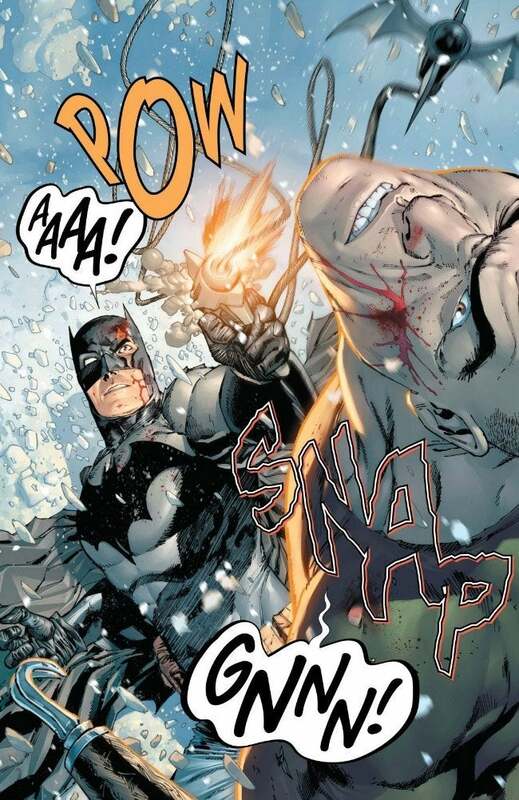 As he closes in to stomp him to his death, Batman unleashes his Grappel Gun at point-blank range right to KGBeasts' face and chin. As you can see in the art below, the collision of the blast snaps his neck, as he confirms on the ground as a puddle of blood starts to form near his neck. After he tells Batman his neck is broken, he tries to get Batman to help him by saying, "if you ...get me help...I will tell you...who hired me...to kill your boy." Batman might have won, but he is worn down and bloody too, and isn't interested in helping KGBeast in the slightest. Batman says, "I got a bullet in my arm and a body of hurt. There's a 300 click walk ahead of me. Through nothing but snow and ice." He spits out some blood and then says, "I'm the world's greatest detective. I'll find out who hired you. And I will break them too. You can get your own damn help." Batman then walks away, leaving KGBeast lying in the snow with a snapped neck and bleeding, and he doesn't seem too concerned about it. "The KGBeast isn’t working alone. As the Cold War between Batman and the Russian killer heats up, Batman’s nose for mystery gets to twitching when he suspects there’s more to the KGBeast’s attacks than initially thought. Not only does this tie back to the court case Bruce Wayne sat on involving Mr. Freeze, there’s another villainous Gotham ghoul in play—but whom?" Batman #57 is in comic stores now.